One of the defects of the post-modern mindset that permeates our world is that tendency to individualism, that absolute commitment to a lack of absolutes. This mindset has permeated the Church too, even in its approach to the Bible. The question so often asked in the small group Bible study is that which is related (vaguely) to the title of this book, “What does this verse mean to you?”. The answers given can be many and various, and in opposition to each other. 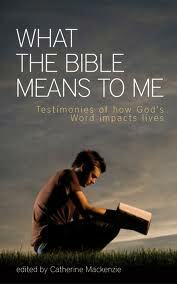 Thankfully ‘What the Bible Means to Me’ is not like that at all. The book is a collection of answers to the question “What does the Bible mean to you?”, but the answers given are not a post-modern jumble of subjectivity but a unified appreciation of the Word of God as the inspired, living, life-changing book that it is. At the same time as their being great unity however, there is as much variety in the responses to the question as there is in the people who have written them. There is absolute agreement on everything, yet amazing variety in the phrasing of that agreement. As the four Gospels describe the same person and work of Christ in different ways, here 40+ different people describing the same Word of God from their life perspective; variety yet unity. This underlines the permanent applicability to us in all conditions and states of life of the Scriptures. In this excellent little book we have the responses of the seasoned mature theologian, the pastor, the housewife, the artist, the multiple sclerosis sufferer, the missionary, the author, all agreeing that in their varied circumstances the Bible has been, and is that powerful, sanctifying, vivifying, comfort-giving, guiding Word. This book is highly recommended, it is one of those books that is hard to put down, but more importantly it is a book which will make you want to read God’s Word more. Between its covers you will find sentiments that you have felt, yet never voiced, or even logically collected in your mind. Here you will find warm reminders of Gospel truth. Here you will find encouragement to press on in daily reading, even if it is apparently fruitless. I wasn’t sure I was going to like this book, I guess my concern was that it might be have been a mild post-modern fog. I couldn’t have been more wrong. Really, I should have known better, Catherine Mackenzie has always been a ‘safe pair of hands’ and she continues to be in the concept and editing of this little book. We received a copy of this book from Christian Focus in return for a review the opinions are those of Paul Wallace.